I gaze through unbelieving eyes at the continued rise of unemployed in Europe. Unemployment in the Eurozone has reached another record high with the seasonally-adjusted rate for April 2013 going to 12.2%, up from 12.1% the month before according to the European Commission’s statistics office, Eurostat: An extra 95,000 people were out of work in the 17 countries that use the Euro, taking the total to 19.38 million. 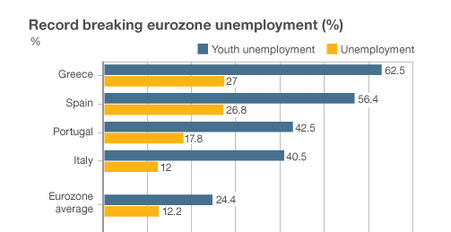 Both Greece and Spain have jobless rates above 25%. The lowest unemployment rate is in Austria at 4.9%. Youth unemployment remains a particular concern; you simply have to wonder what we are storing up in the longer term with this situation. Can the youth ever catch up, can our society as it is positioned give them the opportunities to turn today’s grim world into a world of optimism and contentment, or is it a lost generation? In April, 3.6 million people under the age of 25 were out of work in the Eurozone, which translated to an unemployment rate of 24.4%. Why does this issue of growing unemployment seem to be drowned out by events that seem important on the day but realistically pale in their significance against something as damaging as this present crisis? We are facing significant society challenges. These include declining Economic competitiveness, deepening Social inequalities, rising Mental ill-health, increasing Crime and social disorder and we see growing Alcohol and drug abuse, to name some of the issues being increasingly tackled as part of the consequences of these tough economic and social times. We must increasingly recognise that the cost of deferring concerted action to confront these growing set of social challenges is beginning to rise – and could easily outpace our ability to respond. Can we afford to wait? There are so many pressing questions. More fundamentally, our existing approaches and institutions are also inadequate because, in the main, they lack the capacity to develop the new approaches we need through innovation. We are faced increasingly with the ‘innovator’s dilemma’, identified by Professor Clayton Christensen, where a company or in this case whole nations can’t seem to address the changes (rapidly) going on around them. Their existing models become obstacles in the face of changing conditions, deepening issues, new threats from emerging nations, rapidly changing technologies and a growing inability to overcome rapidly changing circumstances wrought by deteriorating economics, (infra) structures and upheavals. Any organisation or system or even nation is susceptible to ‘lock-in’, whereby it loses the ability to develop novel ways to serve its customers or clients or markets because it has invested so heavily in its existing processes and technologies. This is part of one of the fiercest debates on the future of the European Union we have yet to have. Today innovation is increasingly being understood in a broader perspective than just products alone. We are in a period of major transformation in what we mean by ‘innovation’. We need to push innovation across its broader understanding to explore new business models, unique services, greater collaborative techniques and community engagement. Traditional innovation is insufficient for the challenges we face, this will not resolve climate change, an ageing society or reinvent public/ private services that match demand and need. We need greater connections across society. There is a growing buzz around the Quadruple Helix of Innovation, where Government, Institutions (Academia, Foundations and NGO’s), Industry and Citizens need to collaborate together to drive structural changes far beyond the scope of one organizations and what it can achieve on its own. These will be increasingly through innovation engagement platforms where people use the designed structures to purposefully intensify exchanges to co-create value to solve our growing bigger problems. These are times when we need some visionary leadership and thinkers out there. Those that dare to breach present accepted boundaries of rigid beliefs and conventions. Those that push beyond the normal practices and can depart from the commonly held goals of establishment, by looking for non-conventional novel solutions that can draw in more of the disenfranchised, we are seeing today. Social inclusion is a pre-requisite for the creation of a just and cohesive society in which each individual can fully participate and realise his or her potential. Active inclusion, as one strand of the broader social inclusion concept is looking to draw in and deal with inclusion into society of people furthest away from the labour market. We need to make new markets full of engaged young people. There is clearly a latent demand building in our societies and we need to turn this into a more ‘effective’ demand, to forge the links between supply and demand that will generate new value and opportunity. For example, who can invest in effective supply by supporting promising projects and collecting evidence of what works that shows promise of broader societal impact? Then who can we involve who can invest in effectively ramping this up. Perhaps focusing the different Foundations already set up can turn this latent demand into effective demand. This might mean shifting resources from other parts of the world, back into Europe to get the economic engine kick started again. Applying innovation intensity to what we do. We need to rapidly accelerate a rigorous experimentation mentality by focusing far more on major societal challenges that need addressing, before it is too late. Ones that can encourage and embraces local solutions needed and engagement within communities but the learning can be rapidly absorbed and the winning concepts can be scaled up to benefit more communities or areas of need and resolution. How can we encourage and accelerate more of our companies to pro-actively integrate environmental and social impact into their business models? To put into place better measures of investment performance over the long-term that ties into greater social good? There is also a real challenge today to lay out a different position for government. One that is more the facilitator, setting out the conditions for the impact economy ecosystem and supporting in ways that invest in the longer-term infrastructure and platforms that can scale the innovations and partnerships needed to achieve sustainable, long-term growth. Government cannot ‘play’ in all three horizon investment areas, it does not have the capacity, experience, capital and resources. We need leaders who not just make tough decisions but set about putting in place the different conditions, incentives and clarification of who does what and why. The more the short-term crisis extends, the harder it becomes for Governments to participate in mid-term future innovation activities. They simply can’t easily. We are in a current battle to address both short and long-term economic and growing social challenges. We are faced with growing unemployment still, especially here in Europe. The youth of today need to engage, otherwise we are in a great danger of losing a whole generation and that has such significant impact on or nearly everything we have in place today. How are we going to draw upon the imagination and expertise of a broader set of innovators and tap into the entrepreneurs that are out there, to tackle some of these significant societal challenges? Are we at the early stages of a new economic order with even more disruption? Of course we might be in the beginning of a very different set of economic factors. We might actually be heading to a completely different type of economy that melds features which are very different from economies previously based on the production and consumption of commodities. Today we are already seeing blurred boundaries between production and consumption. We need to think about repeated interactions, care and maintenance and not one-off consumption; and a strong role for values and missions that are far more inclusive for society and less focused on individuals; otherwise we end up with a divided society that clash in ways reminiscent of past revolutions where the majority finally rebel. Are we facing even more instability in the coming years? The present value equation in our societies is rapidly getting unstable; we need some fairly radical solutions to reverse the existing trends. I think the challenges will only get harder in the months ahead. We do need to positively disrupt before we get more unexpected disruption occurring. Innovation needs to play an ever increasing part in this to explore alternatives and allow those lost from current economic activities to begin to participate and make a contribution where they see there is a future for them. The rationale behind the declaration states the Vienna Declaration is the first and immediate Core Deliverable of the Conference, created and established during the conference by joint efforts of all participants. Should any innovation be nationally structured? Firstly innovation is not containable within borders; not ideas, not practices, not final concepts. If we try to simply constrain it, it will never get the traction and momentum often needed from those ‘great ideas’ born locally, to ever grow and scale and achieve their true success. Nationalized innovations are never seen or valued by others, and even more importantly, they aren’t seen and adopted as ‘our own’ solutions. Innovation should simply go where it is needed and felt. The closer you are to the final consumer, the greater chance you have of solving their needs or even unmet needs. It is often policy, constrained funding and human interference that intervenes to stop that natural open flow. Thankfully that is changing: as we recognise within our shrinking world, movement is completed now in milliseconds. We inform others, and transfer knowledge and ideas fast. National borders are powerless to stop this knowledge flow and that is good for innovation. Where these innovations are seen as valuable, the ‘smart money’ follows to build. Social issues are even more fluid; boundaries can be even more permeable. The Arab Spring is testimony to that; social and economic crisis facing Europe at present is yet another one where social unrest is driving change. Social issues are forcing change that simply flows across borders. We might still believe one country and its social problems are different from another but they often have the same core issue, concerns, pressures and conflicts behind them. Often because we don’t work on this similarity in early identification we leave ourselves short on insight, as we dismiss “their problems are simply different from ours”- are they really? Also have you noticed how often National organizing activities seem to have a number of inherent blind spots. In this case of Social Innovation, will the filtration system be useful and to whom, the whole social community or narrow groups? Will it be discerning enough? Will it truly represent the broad spectrum of social ills and challenges that are around? Will it simply be a needless obstacle, another filter in the chain? Will anything national represent your views and issues appropriately with a clear enough understanding to add value? Why do we still compare and contrast innovation on a National basis- innovation is global, most global innovation moves where it is best managed or delivered? All national measurements do is simply capture a given part of the activities going on within a geographical area, it complety misses the across border flows that make up the higher value points within innovation. Also any reports you read on national comparision never, I repeat NEVER, can really compare fully each country. Each has different ways it approaches innovation that reflect their context, objectives and conditions. Impact investing for social good through new innovation- a growing momentum? A growing group of investors around the world are increasingly seeking to make investments that generate social and environmental value as well as financial return. Sound impossible? Well, no actually. There is a growing recognition of the need for effective solutions to social and environmental challenges that have increasingly real threat and growing inequalities. Impact investing or more often housed under the broader heading of “Impact Economy” is about finding the ways to combine investors, philanthropists, entrepreneurs and business executives along with governments in finding new and different ways to explore the changing economic and social landscape. Through this emerging newer type of investing there is potentially that the promise of new jobs and profits, mixed in with improved social impact, can be derived from new innovation activities. It needs this convergence and seems to be gathering in pace and broader recognition. On 16 and 17 March 2011, Social Innovation Europe will be launched in Brussels. Funded by the European Commission, Social Innovation Europe will create a dynamic, entrepreneurial and innovative new Europe with the intent for Europe to embrace the broader concepts within innovation and set an example globally for this social movement. The aim is by 2014, Social Innovation Europe will have become the meeting place – virtual and real – for social innovators, entrepreneurs, non-profit organisations, policy makers and anyone else who is inspired by social innovation in Europe. This can provide the opportunity for social innovation – for so long on the margins – to take its place alongside business innovation at the centre of the economic stage. The competitiveness and challenges that Europe faces in the next ten years are significant. Innovation has been placed at the heart of Europe’s 2020 strategy. It is this clear recognition that innovation is the best means of tackling issues that will affect our future living standards is not new in itself, but it is this real political recognition of its place and importance, now that is. Innovation is also our best means of successfully tackling major societal challenges, such as climate change, energy and resource scarcity, health and aging and becoming more urgent each day to address in more systematic ways. European funding of innovation in recent years has perhaps placed far too much emphasis on research and development to deliver the growth and jobs it requires. Social will dominate innovation thinking in 2011 and beyond. Putting the word social into our innovation thinking is going to be a really important thing to do in the coming year, if you haven’t already. It will dominate our actions increasingly. The challenges of ‘social’ is everywhere; within organizations, in all sorts of collective movements, in politics, across government, society, markets, academic institutions and effecting our personal lives in a host of ways. Society has to face up to some really tough challenges and only innovation can solve these with human beings inventiveness and ingenuity. Regretfully we have still an accelerating ‘creative destruction’ and we are often more Schumpeterian than ever. Something has got to give and it will be within the broad social domain where it will all come together, many social things are converging or feeding off each other. Let’s take a brief look at all this social orientation going on.